Were the two calls at the end of the Heat/Pacers game last night fair? 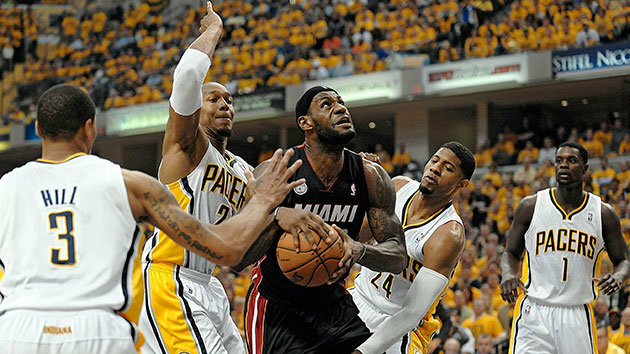 For those who did not get to watch either the game or the highlights of last night’s contest between the Miami Heat and Indiana Pacers, you missed a lot. Indiana was able to overcome their no-show of a game three and edge Miami in game four 99-92, but not without controversy. There were two important calls that were being debated this morning, with the first involving LeBron James fouling out. With just under a minute remaining in the final quarter, James set a screen at the top of the key for Dwayne Wade, but was called for an offensive foul for tripping the Pacers’ Lance Stephenson. I don’t think there is a question as to whether or not LeBron committed a foul by definition, but the situation is what really needs to be considered. It’s game four. There is under a minute left. The Heat are down four points with the ball. It’s the NBA Eastern Conference Finals. I do not like the Miami Heat at all. But my opinion on that play is that a foul should not have been called. As much as I liked to see Indiana win, LeBron should not have been thrown out of the game. He had just hit a huge three-pointer, and I thought that Miami was going to win the game as long as he was in. The referees changed the direction of the game, and ultimately the outcome, with that play. Even though James was gone, the Heat were still not done. The difference was still four on the Heat’s next offensive possession when Mario Chalmers handed the ball off to Dwayne Wade. At this point, there was about 30 seconds in the game. Wade took a dribble going towards the hoop then stepped back before passing the ball off to Shane Battier, who knocked down a three. The problem is that the shot was waved off because Wade was called for a travel. The stepback did look awkward because it was a little more drawn out than most stepbacks, but, once again, the referees got this call wrong. The truth is that it was not a travel at all. And, once again, the refs should have considered the situation. Traveling is the most common no-call in the NBA. The game would have been down 96-95 and the Heat would have had a shot to either tie or win the game. I think that the referees definitely changed the outcome of the game, and I also think that the referees should be talked to by the Director of Officials because the refs swallow the whistle on those two plays more than nine times out of ten. 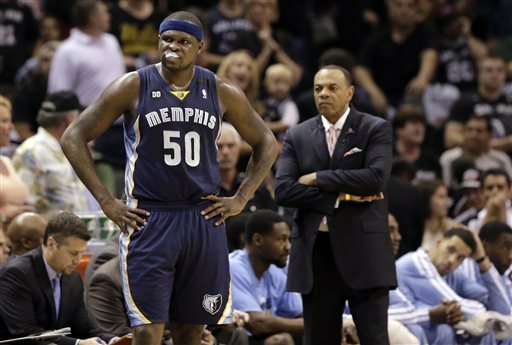 This picture best explains the first two games of the Western Conference Finals for the Memphis Grizzlies. Game one resulted in a 105-83 throbbing at the hands of their opponent, the San Antonio Spurs. In game two, the Grizzlies were able to scratch and claw their way into overtime, where they eventually lost after only scoring four points in the extra period. The series is now going to Memphis, where the Grizzlies need to defend their home court in order to stay alive in the series. Although they are down 2-0 to an experienced San Antonio squad, there is not much that they need to fix. Now, it seems like this is a big problem because “defense” covers many smaller factors. But, these are the Memphis Grizzlies, a team that has made their name off of playing gritty defense. This season, they allowed the fewest points per game with an impressive 89.3 per contest. Also, they allowed the third-lowest field goal percentage during the regular season, holding opponents to an average shooting percentage of just 43.5% per game. In the two games this series, Memphis has given up an average of 99 points per game, while allowing the Spurs to shoot 48% from the field. Numbers like these would lead one to believe that this cannot be fixed, but they showed their true colors in the fourth quarter this past Tuesday night. They held the Spurs to just nine points in the fourth quarter, and to just two points in the final 8:14 of the game. The Spurs turned the ball over, while Memphis capitalized on almost every one. This was the real Grizzlies team that we had not seen for the first nearly seven quarters of the series. Tony Allen received the most points in all-NBA defense voting this year, while guard Mike Conley made the all-NBA defensive team along with center Marc Gasol, who was named the NBA’s Defensive Player of the Year this season. There is plenty of defensive talent on this roster, it is just a matter of Memphis really focusing on shutting down the Spurs. The question is, will they? We will see in about five hours. 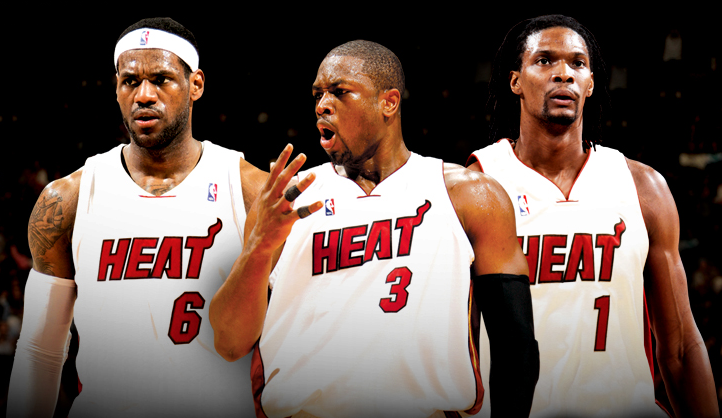 Could the Heat Beat the NBA-Record 33-Game Win Streak? Before the 1971-1972 NBA season, no team in league history had ever won more than 20 consecutive games. Then came the Lost Angeles Lakers. They began that season with a decent 6-3 record, but it surely was nothing compared to what was to come. 33 games later, and with a staggering 39-3 record, their fourth loss came at the hands of the Milwaukee Bucks, who ironically tied the previous record for consecutive wins with 20 just one season before. It took 36 years for another team to eclipse the 20 consecutive wins mark, but the 2007-2008 Houston Rockets would falter soon after and see their streak end at 22 games. Well, there’s your little history lesson for the day, kids, and now I digress. What I’m trying to usher in is the fact that the Miami Heat have just won their 21st consecutive game, beating the Milwaukee Bucks eerily enough, and are raising the question of possibly beating the streak of the Lakers set over 40 years ago. I’ll open my argument by saying that, in my opinion, the Heat are the most talented team in all of basketball. LeBron James will go down as one of the three greatest players to ever step on to the court. Dwayne Wade is a phenomenal guard, and one of the best players in the Association today. Chris Bosh is another star player that is also one of the best in the game, but is overshadowed by Miami’s plethora of talent. They have the best three-point shooter in NBA history in Ray Allen. Shane Battier is both a great defender and a 42.5% shooter from beyond the arc. I could go on, but I will stop there. Despite all of this, the Heat will not beat the streak that was achieved by Los Angeles, all bias put aside. Is it because they are not one of the greatest teams of all-time? No. This roster should be remembered as one of the best to ever be assembled. But the fact of the matter is that the NBA is not what it used to be. Of course, there has always been a premier level of talent, don’t get me wrong, but the game has evolved exponentially over the last 40 years. Wilt Chamberlain, a member of the ’71-’72 Lakers squad, was a guy who averaged over 35 points per game for an entire season six times. His career season-high averages are 50.4 points per game and 44.8 points per game. Nobody will ever be able to dominate like that ever again because there is too much talent, and athleticism especially, in today’s game. The Lakers also did not really have a weakness on their roster. They had four Hall-of-Famers (although Elgin Baylor was at the end of his career). They had a great point guard in Jerry West. They had Chamberlain inside. Everybody on the team could shoot – only one player had a shooting percentage worse than 43 percent. The Heat do have a big weakness though, and that is size. Granted, they are 50-14 without size, but they are 30th in the NBA in rebounding. How are they supposed to win 13 more games in a row? Winning 34 consecutive games with their size disadvantage would be an impressive feat. Of those 13 games, only four come against playoff teams. But in two days, they have to take on their rival, the Boston Celtics, who are disgusted with the current streak and are more than eager to end it. Paul Pierce said that he hoped for the Miami Heat to lose every game until the end of the season, while Jason Terry pulled his best Mikayla Maroney impression by saying basically that the streak does not impress him, nor does anything that the Heat do. The Celtics want to beat them badly, and this is where I see the streak ending, as Boston will pull out all the stops to end the streak at home. What if the Heat beat the Celtics though? Well maybe I will type up another blog to further assess the situation. But no matter what, until Miami actually wins their 34th consecutive game, I will not say that it is possible. Can the Spurs Overcome Age and Win the Title? As you all know, the San Antonio Spurs are and have been one of the best teams in the NBA for the last decade. They’ve recorded at least 50 wins or more in each of the last 13 seasons, including the shortened 66-game season last year, when they posted a league-best 50-16 record. They currently have the best record in the NBA this year at 48-15, and are on their way to their third consecutive number one seed in the west. However, there remains the everlasting hindrance in San Antonio. Their age. The Spurs are once again one of the oldest teams in the league with an average age of 27.9 years old. The centerpiece of their organization, Tim Duncan, turns 37 in April and Manu Ginobili turns 36 in July. Both Duncan and Ginobili have seen substantial cuts in playing time over the past couple years. While Ginobili’s minutes have never been astonishingly high due to the fact that Gregg Popovich has mostly used him as a 6th man, he has only seen an average of 23 minutes a game over the past two seasons. Duncan, over the last three years, has seen his playing time drop to around 28 or 29 minutes a game, compared to the 35 minutes that he’s averaged throughout his career. While both players are still competing at an incredibly high level for their age, you have to wonder when their energy will burn out. Two years ago, after finishing 61-21 and locking down the 1 seed, the Spurs lost to the Grizzlies in the first round 4-2. Last year they lost in the conference finals to the Thunder 4-2 after finishing first in the west again. Will this vicious pattern of dominating the regular season and failing to succeed in the playoffs continue? It seems likely. Tony Parker is out four weeks with a left ankle sprain, and that leaves the inexperienced Cory Joseph to take his place at the point. Joseph is unfamiliar with the Spurs offense, and hasn’t seen any real action up until last week. If the Spurs hope to secure their third consecutive Western Conference crown and make it back to the Finals, a few things will have to happen. 1) Pop cannot stray from his game-plan of limiting Duncan and Ginobili’s minutes. 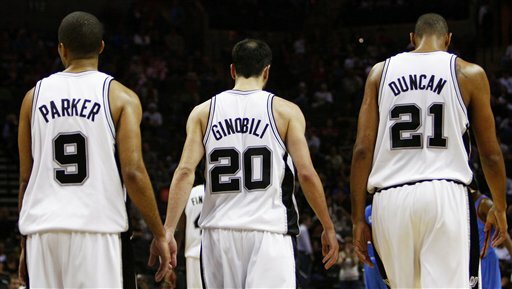 Just because Parker is out, Duncan and Ginobili shouldn’t have to play more minutes. Rest their bodies! 2) Force the young guns to step up! Kawhi Leonard, Gary Neal, and Danny Green need to show that they are capable of scoring the basketball. Leonard’s jumper has improved greatly over the span of one season, he just needs to assert himself more in order to take pressure off of Duncan to score so much. Danny Green is another player that needs to get more involved. He’s already having his best season, averaging double digits for the first time. If he can score 15 a game in Parker’s absence, Ginobili will be under less pressure as well as Duncan. And lastly, if Gary Neal can limit his turnovers and share control of the offense with Joseph, it will help acclimate Joseph to the NBA game and relieve him of some of his burden. 3) In the first round of the playoffs the past couple years, Popovich loaded Duncan and Ginobili up with minutes that they rarely saw the entire regular season. This change not only slowed down their game-play, but it tired the two veterans out much more quickly. If Pop limits their first round minutes to fewer than 30 a piece, San Antonio should be able to slip by without overworking their veterans. Should Tony Parker recover fully in time for playoffs, I actually believe that his injury could work out nicely for the Spurs. It will force the young players to step up, and it will provide them with key experience in critical games, which could help late in the postseason when the veterans are tired. I know everything thinks that the Spurs are too old to last throughout the playoffs, and that no one can beat the Miami Heat, but I think Gregg Popovich and company have one last playoff run to put on display, and by the end of this season, I think Tim Duncan will be able to fill up an entire hand with NBA rings. If/When Do The Lakers Slide Into The Eighth Spot In The West? I listened to this man, Kurt Rambis, speaking about the Lakers on SportsCenter this afternoon. When he explained what he felt Los Angeles needed to do to make the playoffs, I was kind of confused. When he was talking, he made it seem like there was an incredible and almost insurmountable gap between the Lakers and the eighth spot. The gap, as we speak, is a game and a half. Mr. Rambis, you’re wrong. I no longer believe that there is a question in regards to if the Lakers will get into the eighth spot, but when the Lakers will make the move. Will the Lakers stay there? That remains to be seen. But, mark my words, the Lakers will get into the eighth spot in the Western Conference. The next question is, who falls? Well, right now, there are three teams that are somewhat within reach. Golden State is currently in the sixth spot and four games ahead of the Lakers. Right now, I am ruling them out. They are 20-7 at home this season behind one of the best, if not the best, home crowds in all of the association. Even better for the Warriors, they play 14 out of their final 20 games at home. How can Los Angeles compete with that? They can’t. The next team in sight is the Houston Rockets. Houston is the current holder of the seventh spot in the West and two games ahead of the Lakers. There is a possibility that the Lakers could catch the Rockets. If it were to happen, would I be surprised? No. I don’t see it happening though. First of all, the Rockets are the highest-scoring offense in the NBA. In one season, James Harden has gone from Sixth Man of the Year to superstar in just one year. Chandler Parsons is having a very strong sophomore campaign, scoring 15 points and shooting about 39 percent from beyond the arc and Jeremy Lin is quietly having a solid season, averaging 13 points and six rebounds a game. In addition, Houston is ninth in the league in point differential. Are they better-suited to win a playoff series than the Lakers? Probably not, but they will hold on over the last 19 games. Utah: @ Chicago, @ NY Knicks, vs. Detroit, @ Oklahoma City, vs. Memphis. My Prediction: 1-4 after five games, 33-34 overall. Los Angeles: vs. Toronto, vs. Chicago, @ Orlando, @ Atlanta, @ Indiana. My Prediction: 3-2 after five games, 34-33 overall. The way I see it, Utah only beats Detroit in that rough stretch of games. Los Angeles takes care of Toronto, Orlando and Atlanta and finishes their next five games two games better than Utah. So, I think that Rambis will be surprised to see that in just eight days, the Lakers will have a one game lead over the Jazz in the West. An alley-oop thrown down by the Hornets’ Al-Farouq Aminu with just under nine minutes to play in the fourth quarter put the final nail in the Lakers’ coffin. 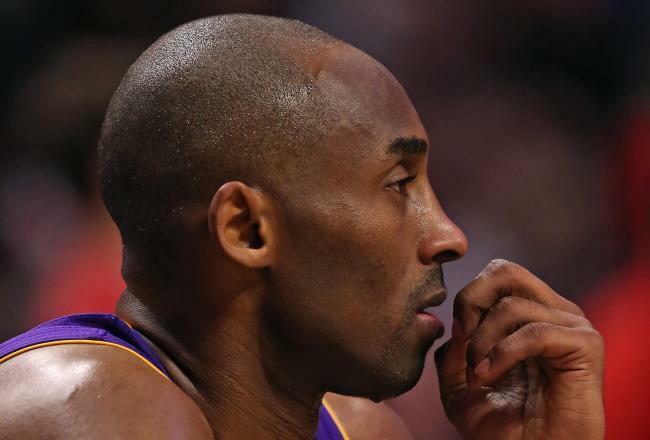 Luckily, for Lakers fans, Kobe Bryant doesn’t give up. The Lakers were able to demolish New Orleans and their 17 point lead in under nine minutes, winning the game 108-102. It was amazing to see the Lakers show so much fight in the game, yet, at the same time, Los Angeles should have never been in that predicament in the first place. There were definitely some negatives in last night’s contest, but we can start with the positives. Sure, the six turnovers in the game looks bad, but the man also played 42 minutes. Outside of that, his numbers are astounding. He scored 42 points while shooting 67 percent. He shot close to 50 percent from beyond the arc and shot around 80 percent from the line. In addition, he added seven rebounds and 12 assists. There aren’t even a handful of guys in the league capable of doing this, nevermind when you add in the age factor. He’s all alone. He was clutch down the stretch, hitting shot after shot, including a go-ahead jumper with under 40 seconds left and a breakaway dunk, which was the real final nail in the coffin. Dwight Howard: Finally. Sure, Howard pulled down his fair share of rebounds over the last two games (31 to be exact), but the scoring was nowhere to be found. Against both Oklahoma City and Atlanta, Howard scored a combined 17 points on 6-of-19 shooting. For a man who claimed recently that he was still the best center in the game, he was not showing it on the offensive end. Last night was different. Despite playing most of the game with foul trouble, Howard still managed to play 35 minutes. In that time, Howard had one of his best all-around performances of the season, scoring 20 points on 9-of-16 shooting on the offensive end and pulling down 15 rebounds, adding three steals and blocking four shots on the defensive end, including a clutch, left-handed block on Robin Lopez. It was nice to see Howard play a solid game on both sides of the ball. Jodie Meeks: He is not always the most consistent player off the bench for the Lakers. They brought him in this year knowing that he could really shoot the basketball, and he showed that last night. He saw 26 minutes of playing time and made the most of it, knocking down five three’s en route to a clutch, 19-point performance. He was the only member of the Los Angeles bench to have a positive plus/minus, and in his time on the court, the Lakers outscored the Hornets by 19 points, a total higher than any other Laker player. I’m not saying that I expect performances like this every night from him, but Los Angeles does need to see more of this if they want to be a serious playoff contender down the stretch. 33-9: That was the score of the fourth quarter; Lakers 33, Hornets 9. Going into the fourth, the Lakers were down 18 points. Three minutes in, the outlook was bleak, as the Hornets still had a controlling 17-point lead. But, for the second night in a row, Los Angeles mounted a furious rally, this time a successful one. New Orleans only made four shots the entire quarter, and none in the final half of the fourth. In the final 6:30 of the contest, Los Angeles went 7-of-10 from the field while scoring 20 points. The Hornets shot 0-of-12 from the field and scored zero points. That, my friends, is how you finish a basketball game. This game wasn’t all beautiful though, as I can really only glorify one quarter. Here are some numbers that the Lakers need to improve on. 67: That’s the number of points that New Orleans scored in the first half. Really, Lakers? Just one night before, Oklahoma City put up 71 points in the first half. Being that it is the Thunder, at least it makes sense. But, the now 21-41 Hornets? No. Unacceptable. If the Lakers had played just about any other team last night, they would have gotten run out of the gym for the second straight night. 36: The Lakers were out-rebounded last night 36 to 52. I know that without Pau Gasol, the Lakers are not quite as big as they once were. But, Los Angeles has been without Gasol for over a month now and they still rank fourth in the Association at 44.5 rebounds per game. New Orleans ranks 22nd in the NBA. With a discrepancy like that, not many teams could win a game, but I guess the “W” is all that matters. 2: In 48 minutes of play, Los Angeles was only able to score two fast break points, which came from Kobe’s dunk with under 30 seconds to go in the game. The Lakers are not a young and fast team. I get that. Two points though? How are the Lakers supposed to match up with other teams in the West like Denver, who averages 19.7 fast break points per game? Or Oklahoma City, who puts up 17.1 points per game on the fast break? This is probably the most worrisome stat for me because this is going to be the hardest issue to fix. The Lakers won, which is good news. There is even better news, though. Last night, Utah squandered a lead on the road and lost to the Cleveland Cavaliers, 104-101. After last night’s games, Los Angeles has now moved to within a game-and-a-half of the Jazz for the eighth spot in the West with 20 games left to play. Things are looking up in Lakerland! This face pretty much describes last night’s game against the Thunder. For the third time in four game against Oklahoma City, the Lakers’ defense took a night off and let the Thunder offense put on a show. Although the Lakers made a strong second half comeback, they could not handle the 71 first-half points from the Thunder. Oklahoma City pulled away late and won 122-105, winning the season series three games to one. Despite a disgusting loss, there were a few positives in last night’s game. For starters, Kobe Bryant scored 30 points once again, and he now leads the NBA in 30-point games. He left the court in the first quarter after injuring his arm, so him dropping 30 was impressive. Also, Metta World Peace had a solid second half that got the Lakers back into the game. He ended the contest with 16 points on five-of-eleven shooting. Like World Peace, Steve Nash also had a solid second half and finished the game with 20 points. For the fifth night in a row, the Lakers were able to shoot over 40 percent from long range. They made 12 out of their 29 attempts, with seven different players adding to the total. This recent surge of impressive three-point shooting gives Lakers fans something to be optimistic about. Not many teams are going to be able to keep up with the Lakers if they are able to shoot well from beyond the arc. Los Angeles was also able to take 40 free throws last night while forcing 27 fouls. Although they were on the road, they were still able to take 16 more free throws than the Thunder (granted Oklahoma City did shoot better from the field). Of those 30 attempts, the Lakers were able to make over 75 percent of them despite Dwight Howard only shooting four-of-eight form the line. That’s about it for the positives…there were plenty more negatives. First of all, the first half from the Lakers was absolutely deplorable. As I stated earlier, the Thunder were able to score a whopping 71 points. I understand that Los Angeles does not hang their hat on their defense, but there has to be a point where pride steps in and stops the bleeding. The Lakers were able to score 55 points themselves, which should be enough to hang with anybody, but, as Bart Scott would say, they couldn’t stop a nosebleed. Giving up 71 points is quite a feat, but how they did it was equally, if not more, awful. The Thunder took 13 more shot attempts in the first two quarters, shooting 26-of-50 from the field. In addition, the Lakers were outscored 28-to-10 in the paint in the first half. With Dwight Howard down low, there should never be a discrepancy that large. The worst stat of the first half though was by far the turnover differential. While the Lakers turned the ball over 11 times, Oklahoma City only had one turnover in 24 minutes. The third quarter was a good one for the Lakers, as they outscored the Thunder by eight, but the fourth quarter was a let-down. Los Angeles made a push and cut the deficit to just five, but it went down quickly from there. The Lakers simply just ran out of gas. In the last five-and-a-half minutes, the Lakers did not score once and Oklahoma finished the game on a 12-0 run. If the Lakers were to make the playoffs, there would be a good chance of them having to play Oklahoma City. I really do not hope this is the case because I do not think the Lakers match up well against them, especially against Russell Westbrook. The Lakers do not have a guard that can shut him down; not many teams do, but Los Angeles definitely does not. If the Lakers have a few more nights like this though, they won’t have to worry about the playoffs.